Thailand is known for its tropical beaches, luxurious royal palaces, ancient ruins along with a fascinating history and unique culture that includes delicious Thai food. It is also known for providing some of the best golf experiences in the east. 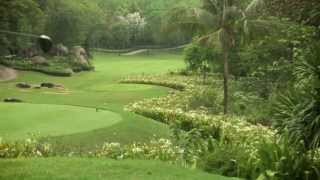 And like the food, Thai golf courses are full of spice and the Land of Smiles gloriously lives up to its reputation for providing the creme-de-la-creme of golf in South Asia. Boasting more than 250 golf courses, several designed by international maestros, the diversity of the courses remain a key reason for Thailand’s popularity. One day you can experience a super challenging parkland layout of palm tree-lined fairways with well-guarded greens, and the next day enjoy 5 star resort-style services. To this, add the friendly faces of the ever smiling caddies whose engaging service will leave you feeling warm, refreshed, and relaxed. Varied destinations mark the country, each with a generous sprinkling of top notch golf courses for every style, skill and tastes. In the northern highlands are Chiang Mai and Chiang Rai where you can breathe fresh mountainous air. The central region is dominated by the glitzy capital of Bangkok, while the beach towns of Pattaya and regal Hua Hin lie within a 2.5 hour drive on either side of it along the Gulf of Siam. Finally, an hour’s flight down south takes you to the pearl of Andaman Sea, the famed laid back island of Phuket boasting some of the most luxurious resorts in Asia. The best time to visit Thailand is between November and March when the temperatures are lower and rainfall is also less. March to May remains hot and the monsoon comes between June and October but this is the low season rates and thin crowds. Pattaya is always switched on and fun. From sunrise to sunset, Pattaya’s beaches are constantly brimming with life, as water sports lovers and sun worshippers take to the waters. After dark, the action shifts to the streets, as revellers explore its electrified nightlife scene, where drinking and partying continue until dawn. Quite surprisingly, Pattaya's “best kept secret” are the 20 odd world class Golf courses offering an experience that would rival any top European or American course, but at a fraction of the price. Go for it - it's a steal! Less than three hours from Bangkok, lies the erstwhile weekend retreat of the Thailand royal family. While the sleepy hamlet of Hua Hin continues to weave it charm with pristine beaches, great seafood, idyllic resorts and an eclectic lifestyle, it is golf that reigns supreme here now. Three of the eight Hua Hin golf courses are considered to be among the best in Asia. The best part - all of them are very close to the city center which also offers innumerable attractions apart from golf. The ‘Pearl of Andaman Sea’, Phuket, is Thailand’s largest island offers not only world class golf courses, but also spectacular scenery, tropical sunsets over palm lined beaches, luxurious accommodation and a vast array of nightlife activities. With the great selection of championship golf courses,several playing host to major tournaments, Phuket is a golfer’s dream. Golf apart, there’s always something to see and do on Phuket Island - from natural to pre-natural, from land-based to water activities, there is never a dull moment.